Brugmansia, known among people of South America as the “Tree of The Evil Eagle,” is a potent medicinal and psychoactive plant that has played a prominent role in South American Andean and Amazonian medicine and shamanic practice for centuries. All parts of the plant, especially the leaves and the flowers, have been employed as medicine. It has also been used in rituals and ceremonies for establishing contact with long-departed ancestors. Native to the tropics of South America, brugmansia is distributed broadly throughout the Andes mountains, and from as far north as Venezuela and as far south as Chile. Today, seven unique species of the plant are recognized. A member of the Solanaceae family, brugmansia contains the highly active tropane alkaloids hyoscyamine, atropine and scopolamine. The latter alkaloid occurs in the greatest concentration. Known as angel’s trumpets, the large bell-shaped flowers of the plant are beautiful to look at, and they emit a captivating fragrance in the evening as dusk settles. This clever expression of perfume attracts the hummingbird moths – also called sphinx moths – which pollinate the plant. 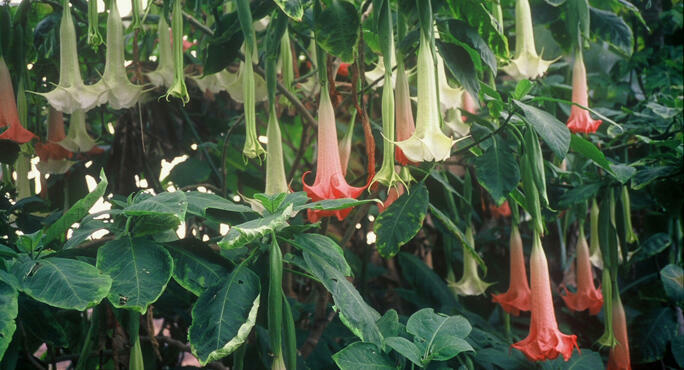 Brugmansia bushes become small trees over time, bearing as many as hundreds of bell-shaped flowers apiece. In modern medicine, the tropane alkaloids found in brugmansia demonstrate a variety of uses. Isolated in 1880 by German chemist Albert Ladenburg, the plant’s scopolamine is used to relieve motion sickness when applied in a transdermal patch, mixed with opiates as an anesthetic used during childbirth, and in multi-ingredient asthma medications. Hyoscyamine is used in the treatment of gastrointestinal disorders, including colic, diverticulitis, spasms, peptic ulcers and irritable bowel syndrome. When mixed with opiates, it helps to relieve neuropathic pain. Hyoscyamine has been marketed under numerous drug names. Atropine is listed by the World Health Organization as an essential drug. If you have ever had your pupils dilated for an ophthalmological exam, atropine may have been the substance dropped into your eyes to achieve that effect. Cleopatra reputedly employed atropine from henbane to dilate her pupils for beauty enhancement, imparting a translucent gaze. Atropine also has a modern use for treating cardiac arrest and as a treatment for poisoning due to some nerve gases. All three of the tropane alkaloids from brugmansia are poisonous even in modest quantities and must be used with great care. Consumed orally, they can cause nausea, vomiting, dizziness, rapid heartbeat, disorientation, hallucinations, erratic behavior, and even death. When consumed as a tea, brugmansia can produce extreme and often hellish visions, which is why it is not preferred by many people. Andean and Amazonian people believe that the spirit of Toé in brugmansia is a wise, if demanding, teacher and that the plant can impart knowledge and power if its use is mastered. Some shamans work primarily with brugmansia, seeing visions of evil serpents, man-eating jaguars and poisonous snakes. After consuming a potion of this plant orally, the subsequent journey is often an ordeal. A 2006 article published in European Archives of Psychiatry and Neuroscience detailed a tragic account of an 18-year-old German man who drank a cup of tea made from two brugmansia blossoms. A short while after drinking, he entered a small bathroom, where he severely mutilated himself. The young man had experienced amnesia after consuming the tea. He had no prior mental disorders. Brugmansia can so distort all sense of reality and perception that some very bad things can happen. Translation: Don’t drink brugmansia tea!